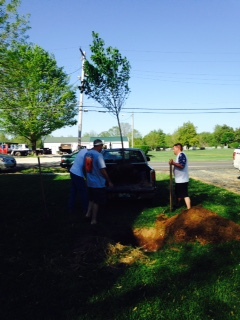 24 April 2016 (Hodgenville, KY) — The La Rue Family gathered at their ancestral home on Greensburg Street for a ceremonial Tree Planting honoring family patriarch James D. La Rue Jr. 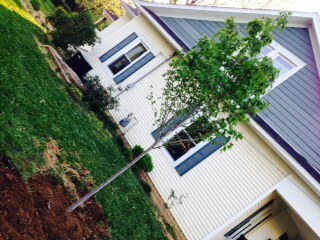 The Sunset Red Maple Tree was christened The James Doane Tree. Family Trees are something of a Tradition as James D. La Rue Jr. was an avid supporter of the Arbor Foundation and had planted over 30 different varieties of trees on his Greensburg Street property, which has been in the family for well over 100 years. 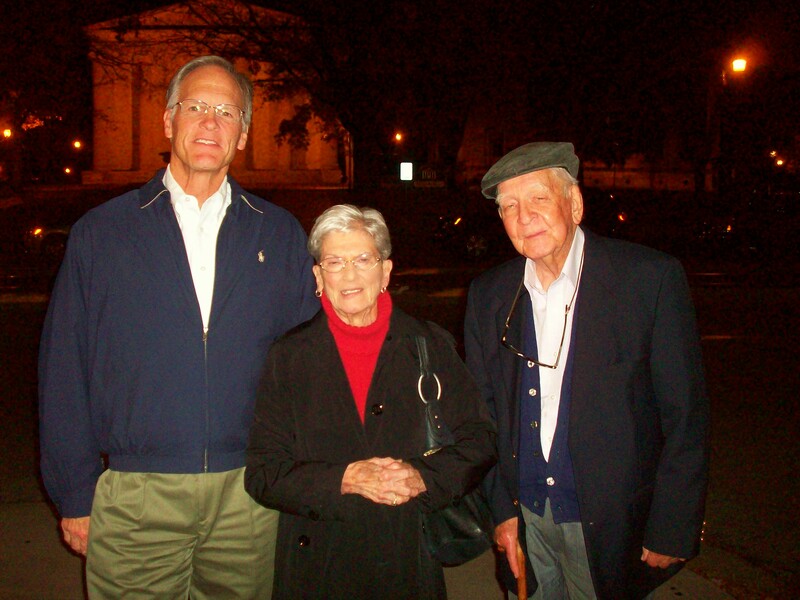 With his children, grand-children, great-grandchildren, and a favored cousin in attendance, James D. La Rue Jr.’s ashes were interred in the Tree planting along with a coupla shots of Bourbon, a Lincoln Penny, and a rough draft of his book, Mary Brooks: Portrait of a Kentucky Pioneer, Family Matriarch & Granny Woman. Like great families, Trees require care and nurturing to form branches and deep roots. The James Doane Tree symbolizes this metaphor and reminds us that One cannot have Wings without Roots. James D. La Rue, Jr., 94, of Hodgenville, died Aug. 11, 2014, at Sunrise Manor Nursing Home following complications from cancer. La Rue was the official historian for La Rue County, a 2012 Distinguished Alumnus of Hodgenville High School, a Paul Harris Fellow from Rotary International for 53 years of service, a charter member of The Lincoln Museum, a founding member of the La Rue County Historical Society, a long-time columnist for The La Rue County Herald News, a former city councilman, and a keynote speaker for five different Lincoln Days celebrations. 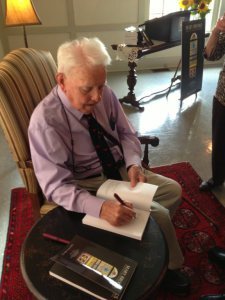 Additionally, La Rue was an alumnus of Lehigh University as well as an Army Air Corps veteran of World War II having served most of his enlistment in India and Burma working as a communications specialist. Upon his return to Hodgenville, he supplemented his work as a farmer by providing accounting services for a local farm supply company. In 1957, he opened an office on the town square in Hodgenville providing tax services to the general public, as well as becoming a founding partner in La Rue Insurance. He also functioned as a Regional Community Liaison for the American Red Cross for many years. La Rue served on the board of directors for the Bank of Buffalo, Sunrise Manor and Red Hill Cemetery Commission for many years. He received not one but two Keys to the City of Hodgenville for Outstanding Service. He was a lifelong member of First Baptist Church where he taught Sunday School and served as a deacon. He was also an active member of Hodgenville Bridge Club where he achieved the distinction of Junior Life Master at the age of 91. In 2013, La Rue published his first book, a well-received history of La Rue County, entitled, Mary Brooks Portrait of a Kentucky Pioneer, Granny Woman, Family Matriarch. He was preceded in death by his wife, Frances Bond Enlow; his parents, Marie Dye and James D. La Rue, Sr., two sisters; and a daughter, Julia Brooks La Rue Orwig. Survivors include one daughter, Paula Varney; six sons: John, Alex, Will, Philip, Ben, and Steve; six grandchildren, and five great-grandchildren. Prior to his death, La Rue was working on a series of essays, entitled, Last Days of An Old Codger, ruminations on a big, long, well-lived Life. Mary Brooks: Portrait of a Kentucky Pioneer, Granny Woman, Family Matriarch represents the culmination of a lifetime of study, preservation, collection, and joy of summarizing the history of the early pioneer families of La Rue County by author James D. La Rue Jr., the official historian of La Rue County and the great-great-great grandson of this remarkable Kentucky Pioneer, Granny Woman and Family Matriarch. With my son William Owen La Rue at Lincoln Days 2013. Biography of James D. La Rue Jr.
Born Sept. 29, 1919 to parents James Doane La Rue and Marie Dye on a farm about a mile north of the town of Hodgenville. A graduate of Hodgenville High School in 1937, La Rue enrolled in the engineering school of Lehigh University in Bethlehem, PA, at the behest of a beloved Aunt and her husband, a professor of Romance languages at the university. Following Lehigh, La Rue returned to Louisville and enrolled in a vocational school and found Accounting was to be the means of support for the family he had yet to create. In 1938, he went to work for Stitzel-Weller Distillery as a bookkeeper. In 1942, he enlisted in the Air Force. Communication Security became his MOS. Half of his 39 months in the service during WWII were spent in India and Burma. Following an honorable discharge in January 1946, La Rue returned to La Rue County planning to farm the 138 acres of land he had acquired before enlisting. He then married Frances Bond Enlow (1921-1984) in the following year. In the years to come, he supplemented his work as a farmer with accounting services for a local farm supply company. And in 1957, he opened an office in Hodgenville to provide tax services to the general public. Years later, the farm would be sold following a span of severe drought and decreased profitability. The newly established tax practice was then combined with the acquisition of a very small general insurance agency which now supports three families. Thirty-four years later in 1991, La Rue was named La Rue County Historian by his friend, Judge Executive Tommy Turner, and continues to serve in that capacity. For 20 years, he wrote and edited a column, entitled “Early Files” for the local newspaper, The La Rue County Herald News. Having served as a keynote speaker for five different Lincoln Days celebrations, La Rue is also a Charter Member of the Lincoln Museum in Hodgenville as well as a Founding Member of the La Rue County Historical Society. In 2012, he was named a Distinguished Alumnus of La Rue County High School and received a special commendation from Rotary International for 53 years of service, where he is honored as a Paul Harris Fellow. With Carl Howell Jr. Hodgenville Rotary Club. Ordered my book today and can’t wait to get it and read it! Your book on MARY BROOKS will only grow in importance with Time, providing future generations with a rich history of the La Rue and Enlow families. Thank You for such a wonderful Comment, Friend.